1 Bedroom Flat For Sale in Rochford for Asking Price £115,000. 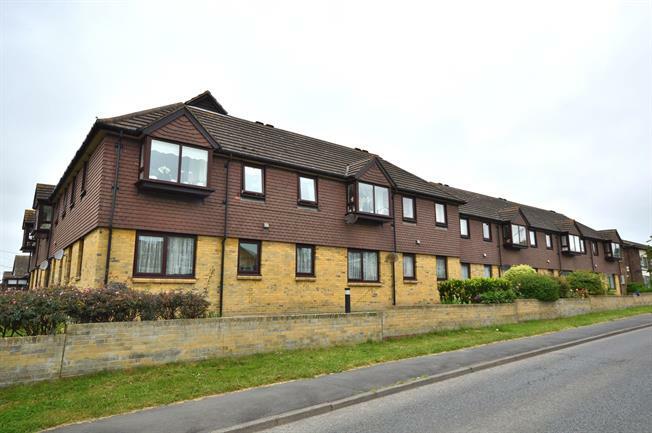 Abbotts are delighted to offer for sale with no onward chain this well presented and well proportioned retirement apartment for ages 55 and over, conveniently located for bus services and within a short walk of Golden Cross shops. This first floor property with a favoured position at the front of the building, features a well sized living room, fitted kitchen, a double bedroom with built-in wardrobes and a fully tiled wet room style shower room. The property further benefits from a house manager/Careline system, a large storage cupboard and loft access, an intercom entry system, a long lease of 150 years, as well as communal facilities including a residents lounge, garden, laundry room and a guests suite. Approximately 457 square feet. Communal front door with an intercom entry system, communal hallway with lift and stairs to first floor and hallway leading to own front door. Front door opening to the hallway, loft access, coved ceiling, large built-in storage/airing cupboard, emergency pull cord, intercom entry phone. UPVC Double glazed raised bay window facing the front, coved ceiling, electric storage heater, access to the kitchen. Fitted wall and base and units drawers, roll edge work surfaces, single sink and drainer with mixer tap, tiled splashbacks, space for a cooker, overhead extractor hood, spaces for a fridge/freezer and slimline dishwasher, coved ceiling, tiled flooring, uPVC double glazed window facing the front. UPVC Double glazed window facing the front, built-in wardrobe, coved ceiling, electric heater. Low level WC, wet room style shower, pedestal sink, tiled walls, heated towel rail, extractor fan. Resident lounge with a kitchenette area, communal garden, residents laundry room, residents car park, guest suite.